We will employ the astrological chart as a map to identify and explore experientially and shamanically the healing dynamics of our relationship. 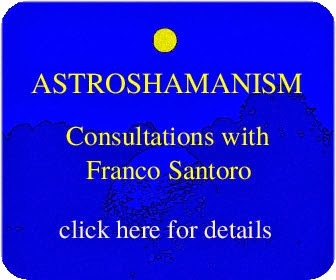 The workshop can be followed by another workshop from 6 to 10 September 2014 (see: https://www.facebook.com/events/570713873041680/) as part of a complete Training in Astroshamanic Soul Retrieval. Soul retrieval is a shamanic practice based on the premise that our soul was once whole and then it fragmented. Its aim is identifying and restoring the missing parts. There are many approaches to soul retrieval and different ways to describe it, depending on belief and spiritual healing systems, encompassing both traditional core shamanism and established religions. In astroshamanism we employ several tools for soul retrieval aimed at representing the full spectrum of variants of our multidimensional self, which are identified with a basic astrological setting, comprising the twelve zodiac signs, houses and planets. This setting strategically define the complete make-up of our multidimensional identity, the entire configuration of our original nature, with all its possible parts, which are meant to be recovered and restored. By train: you can arrive to Villafranca/Bagnone railway station with the line Milan-Livorno or La Spezia-Parma. Let us know your time of arrival and we will pick you up. By plane: the closest airport is Pisa’s Galileo Galilei. Also the airports of Florence and Genoa are close.